The Dwarven Road: Inside Karak Ursus is the second big table I made for WAAAGH! Paca 2012 and is my fist attempt at making two tables flow together (The Dwarven Road: Entrance to Karak Ursus from my first table post is it's sister). I'm quite happy with how this table turned out and will probably do little to change it for next year (other than bolt down those pillars). Thanks to Mr. Joe Rogers for painting up this lovely WAAAGH! Paca troll. 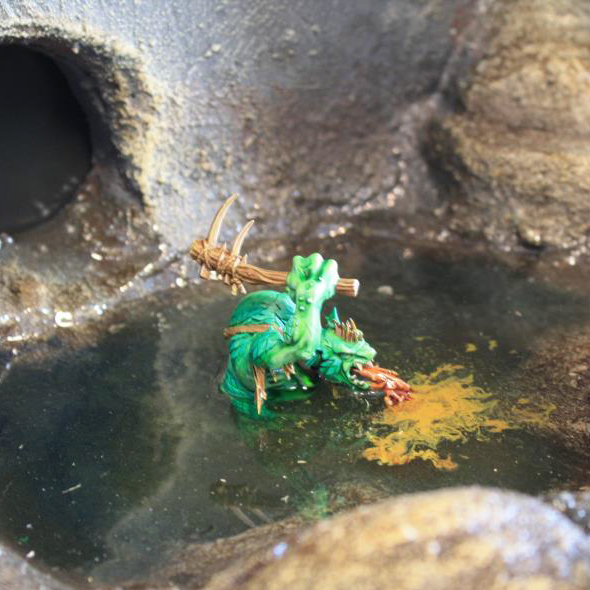 Doing the puke effects in the envirotex pond was one of the highlights of my terrain crafting career. This table was one of the two at Waaaghpaca I really was hoping to play on. The other at the opposite end of the hall with the really huge buildings on it was the other. What the hell are lizards and daemons doing in a dwarven hall?